For more information, please visit the MRGO Website. 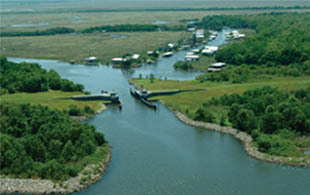 The Mississippi River-Gulf Outlet (MRGO) was authorized by a March 29, 1956 Act of Congress (Public Law 84-455) to provide an emergency outlet from the Mississippi River in the interest of National defense and general commerce and as a safer and shorter route between the Port of New Orleans and the Gulf of Mexico. The act authorized construction of the MRGO Project in accordance with the recommendation of the Chief of Engineers contained in House Document No. 245, 82nd Congress. The MRGO extends from the Inner Harbor Navigation Canal (IHNC) to the 38-foot depth contour in the Gulf of Mexico. 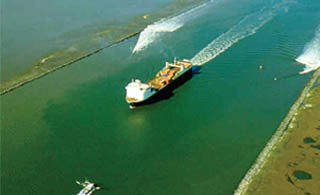 Construction of the MRGO channel began in 1958 and was completed in 1968. All reaches of the MRGO navigation channel were authorized as a 36-foot deep, 500-foot bottom width waterway with the exception of the Bar Channel in the Gulf of Mexico which was authorized as a 38-foot deep, 600-foot bottom width waterway. 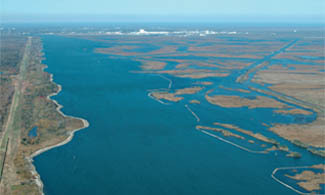 The channel was dredged through shallow bays, coastal marshes and cypress swamps.